East Anglia is England’s breadbasket, a land of milk and honey, a cornucopia of plenty. From crab to duck, sugar, saffron and samphire, poultry and pigs, mustard to mint, wheat, barley and acres and acres of rapeseed that in spring turn the patchwork of fields an iridescent yellow, the flatlands provide some of the most abundant land on Earth. But you can have too much of a good thing. Back in the day, being fat was a sign of wealth and health. Skinny was the fashion of those at the bottom of the social heap, a consequence not a choice. But now, the flatlands are the fatlands; fat is the new thin. Who am I to talk? Now I’ve reached my midriff years, I’m no longer that skinny little waif whose 26 inch waist played to packed houses in the late Seventies. Yes, my middle age spread is, well, spreading. But I’m talking about carbon hoof prints of heffer proportions and they’re attached to people half my age. It ain’t clever and it ain’t pretty. So, my fellow East Angles, if you want to outlive your parents, it’s time to go easy on the pies and the fries. Totally. It was a sign I saw at Norwich Market. I can only imagine how big it is! 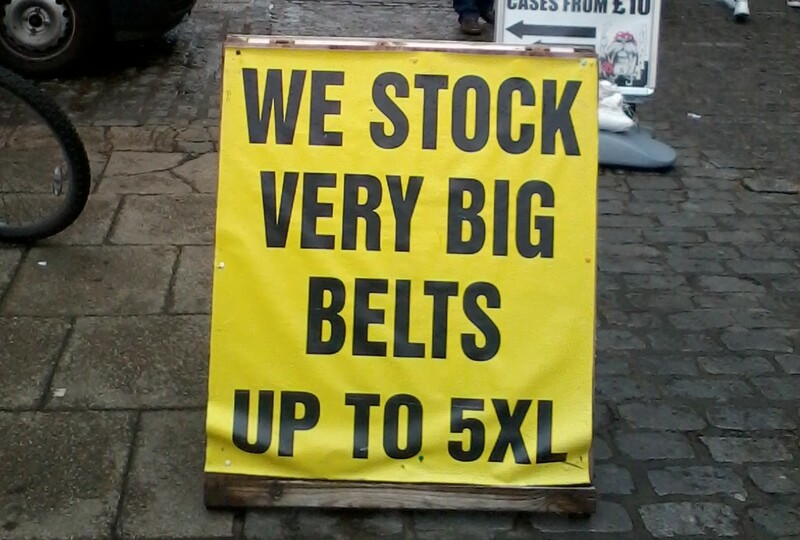 As you know they’re not likely to have me up in the Nimble balloon anytime soon flogging slimmers’ bread [showing my age along with my waistline] but bloody hell, the size of some of the folk you see now on the capital’s streets in their dozens every day – humongous has become the new plump. Honey? I don’t think so since Beyer introduced its neonicotinoids into the fields. I wondered why I saw a bee with a fag in its mouth. It is sad though especially when you see those little children who clearly don’t play outside often enough. Yes, I think you’ve hit the nail on the head. Physical exercise is the key.